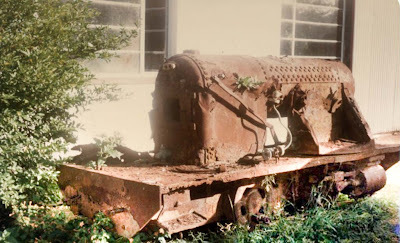 This loco was dug up from the Umfolozi river bed in 1980 after being lost in the 1925 flood. The remains of the locomotive has not been restored. This 0-4-0T 2' 6" gauge locomotive was assumed to be Hunslet Engine Co works no 1032 built in 1914. The locomotive had a 8.25" x 12" design. This information still needs to be confirmed. The locomotive was used by the Umfolozi Co-Op Sugar Plantation at Mtubatuba when lost in the flood. No 2 Hunslet 1032 1910 0-4-2T 8 1/2" X 12"
No 3 Hunslet 1190 1915 0-4-2ST 9 1/4" X 14"
' MATUBA' Avonside 1836 1919 0-4-2T 9 1/4" X 14"
The relic could be any of these engines. After being dug up, the relic was stored for sometime in the care of Mr. A.B. Wessels at the "Zulutrac" Garage in Umfolozi Village. By the end of 1993 it was reported that the relic has been moved to the private house of a Mr Preen in Umfolozi Village. Currently the whereabouts of the relic is unknown. If you know what happened to it and where it is now, please contact me, thank you.